The described above is possible because of their territorial and stubborn nature. Once a damselfly finds a suitable perch, it defends it from other damselflies fiercely and gives it up only very reluctantly. 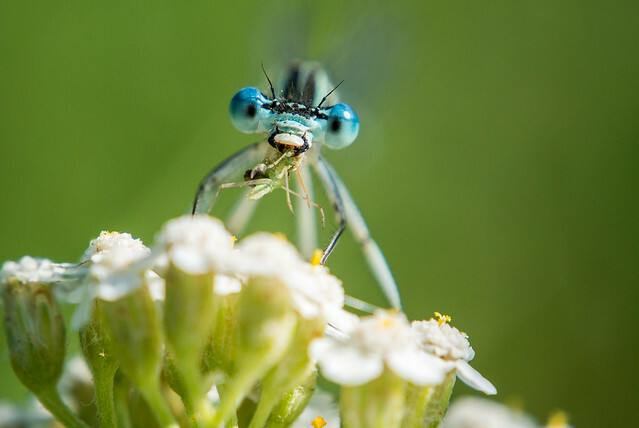 This means that if you move slowly a damselfly may fly away, but it will most likely return in a second or two. What you shouldn’t be doing – and this applies to photographing all insects and arachnids, not just damselflies – is moving towards them like a bull in a china shop. Be conscious of your size and the size of your shadow. Damselflies are brave little beasts, but there are limits to how brave you can be, when you see a giant 1000 times your size stumbling towards you. What you should be doing instead, is approaching them in a way that you don’t cast a shadow on them. If you do, you can be sure that they will fly off almost immediately. The second prudent thing to do is crouch and move towards them in that manner. Reducing your size and threat potential in the eyes of your macro subjects is always a good idea. And last but not least, try to move like a chameleon: two steps forward, one step back. Try to attune your movements to water plants damselflies like to perch on. 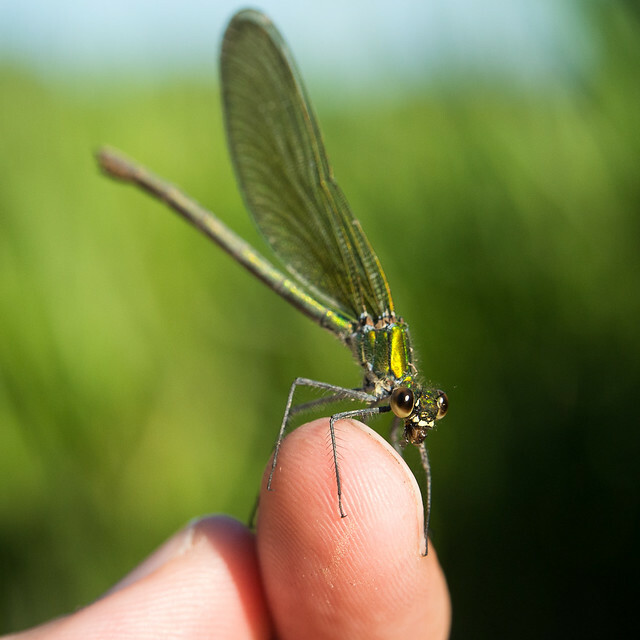 In case you would like to try to persuade a damselfly to sit on your finger: move your arm like a leaf in the wind towards it. Try to synchronize the movement of your arm with the plant a damselfly is sitting on. When you get to about 20-30cm away from it, stretch out one of your fingers and position it so that it’s parallel to the leaf the damselfly is sitting on. It helps to approach with your finger a bit from below. Move slowly towards the damselfly, until you touch one of its legs. 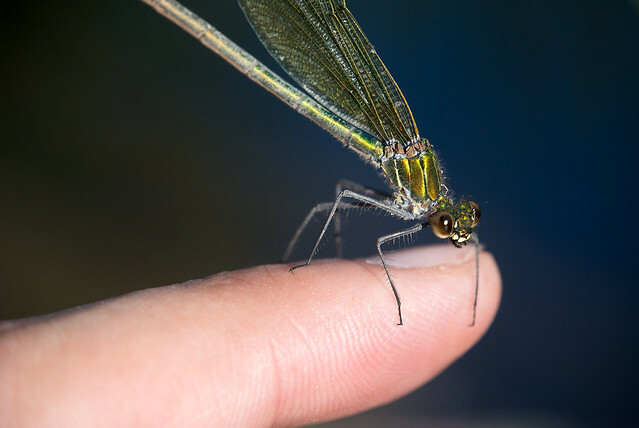 By pushing gently and patiently against the leg, the damselfly will start to climb onto your finger. Once it’s sitting on your finger, it’s time to breathe normally again. 😉 It will now view your finger as its new perch and cling to it. If you closely follow these instructions you will have an easier time photographing damselflies and you will even manage to persuade them to sit on your finger. Maybe not the first several or even dozen times, but you will quickly get a hang of it. After some practice you will be able to do it every time you go out to photograph them. 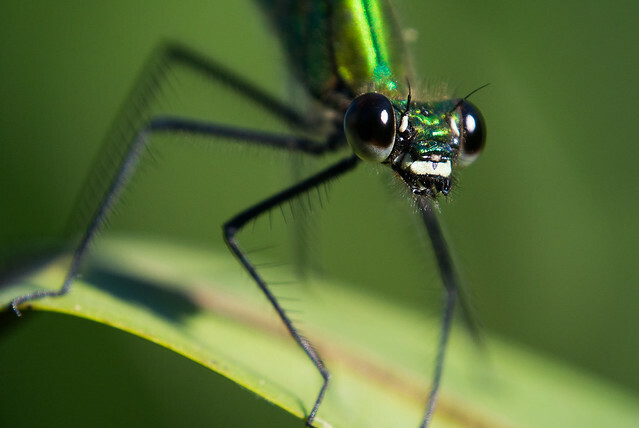 Gear isn’t as important when shooting damselflies, as it is when shooting smaller insects. Pretty much any telephoto zoom with a close enough close focus distance will do. If you don’t have a zoom lens that can focus close enough, consider using or getting an achromatic close up lens or extension tubes. This is what I did for some of the close-up shots. I used a Marumi DHG200 (for some very close shots I used it in conjunction with a Raynox DCR-250) close-up lens on my 1 Nikkor VR 30-110mm f/3.8-5.6 lens. Just recently I wrote a post on photographing macro with that lens – you can read it here. The most important thing, though, is to enable burst mode and shoot a lot of images. If you’d like, you can see me picking up a damselfly in the following video. I’m sorry for the very bad quality. I forgot to bring my 10-30mm f/3.5-5.6 lens with me and the 30-110mm f/3.8-5.6 is simply way too long. I had to record the video with my Ricoh GR Digital III, which only shoots standard definition video. P.S. You can find more of my damselfly photos in this Flickr set. 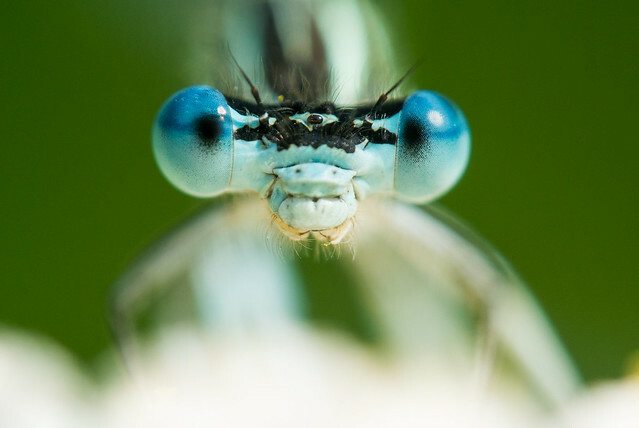 Wow, so now you are a damselfly whisper too! Amazing shots! Were all of the shots taken handheld? What are your favorite camera setting for taking shots of all these little closeup fellows? You noted to set the camera on burst mode but what about all the other settings? Also did you use flash for all of these photos or just some of them? Thanks! I don’t see many damselflies near me but I do have a lot of larger dragonflies. Wow, so now you are a damselfly whisper too! Amazing shots! Were all of the shots taken handheld? All of these were shot handheld. The ones where I hold a damselfly on my finger were shot with just my right hand holding the camera pressed against my eye socket. What are your favorite camera setting for taking shots of all these little closeup fellows? I use fairly standard settings. Also did you use flash for all of these photos or just some of them? I don’t own a Nikon 1 flash, hence all of these were shot with ambient light only. I don’t see many damselflies near me but I do have a lot of larger dragonflies. Dragonflies are paranoid creatures. Haven’t tried picking one of them up, but I bet that it would be difficult. They fly away even if you move very, very slowly. And they are a bit dangerous because of their mass and the speed at wich they fly. Several weeks ago one collided with me – hit me in the chest – and I must say that I was surprised by how strong the impact felt. Like being hit by a small stone. Now imagine one of them crashing into your eye. It’s smart to be cautious when around them. Thanks for all the added info about how you shoot with the V1. Dragonflies can fly 75 miles per hour so I get he hit you at that speed. They are hard to get close too, but I have gotten some photos of them in past years. Thanks for all the added info about how you shoot with the V1. Dragonflies can fly 75 miles per hour so I get he hit you at that speed. Maybe, it felt like a strong hit. They are hard to get close too, but I have gotten some photos of them in past years. Do you have a set of images online? I would like to see them. I think you’ve posted that article in the comments of my YT video. It was a nice read. However the link doesn’t seem to work any longer. It says “Disaster’s Struck! We’ve lost that page”. Hoy cow, man. This is all kinds of cool , Ivan – I am blown away. Great work, and a wonderfully written piece too, to shed some light on it. Thank you so much. Thank you very much, Jan! I am very pleased that you like it.